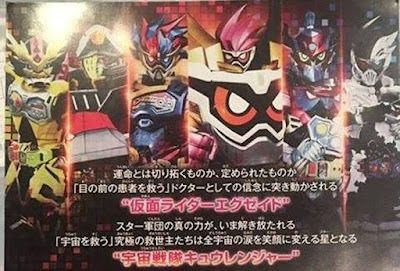 Check-out the newly revealed promotional movie flyer for the upcoming Kamen Rider EX-Aid and Uchuu Sentai Kyuranger summer movies which also gives us our first live look at Para-DX's new Level-Up form! 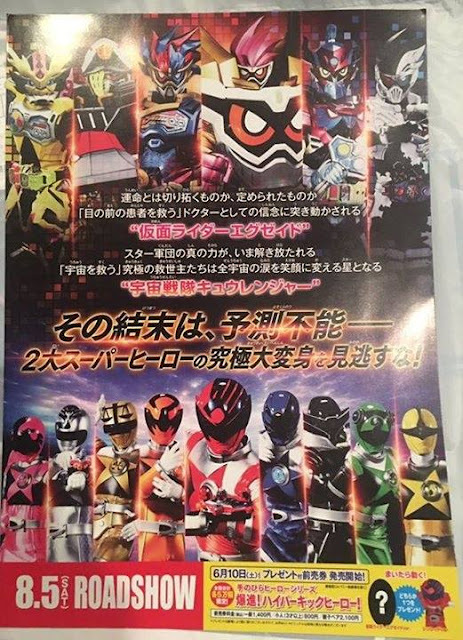 The movie flyer gives us our first live preview of Kamen Rider Para-DX Perfect Knockout Fighter Level 99 and also contains some interesting snippets from both of the movies that are featured here. "Is destiny something to open up, or is it something that is already stated. The beliefs of the Doctors who save the lives of the patients in front will be moved." "The real power of the Star Team will be unleashed. The Ultimate Saviors will become stars to change the tears of the whole galaxy to smiles." Kamen Rider EX-Aid and Uchuu Sentai Kyuranger The Movies will premiere in Japanese cinemas this August 9, 2017. Paradox is really a carbon copy of Ex-Aid here. Bad turns good? That's August 5th, not August 9th.